I have an Akai Advance. @AkaiAdvance, As far as I know, it’s not possible to control Auria’s mixer faders with anything but a Mackie HUI protocol compatible controller. You can’t just send midi cc’s to the faders. Sorry, but I don’t think you can do what you want with your controller. Good to know. I'll edit. Actually the mater and bus’s are mapable. I have a Behringer xr18 I’d like to try. I don’t think they are. Have you ever done this? If it’s there I’m missing it in both he documentation and the interface. Would love to be wrong on this though! As far as I know, Auria’s mixer can be controlled only by Mackie HUI and MCU protocol capable controllers, which is not the same as simply using midi cc’s. The only way I’ve mapped Auria outputs to midi before is by using AUM IAA ports in Auria and then midi learning them in AUM. So it seems that AUM and AB3 are similar. How’s the stability? Also does AUM pay better attention to Auria? And what about Cubasis? Sorry, but I think you’re still misunderstanding this issue. It doesn’t matter if you use Audiobus or AUM or any other host. Auria Pro simply does not respond to midi cc’s to control its faders. Period. This is a design decision made by the Auria developer. There are controllers that support a protocol called Mackie MCU, or also HUI. This is more than just midi cc’s and different. What you want to do is only going to happen with a controller that does that. You are correct that AUM and AB3 are similar, but they have significant differences as well. In my experience there is no difference in stability. Cubasis also does not allow midi cc control of it’s mixer. At all. Not even for MCU or HUI protocols. Someone far more brilliant than I could probably write a Streambyter script that translates midi cc’s to MCU or HUI protocol. You offered to help move Audiobus code forward, so I assume you’re a programmer. Maybe this would be something you would want to dive into. Considering it would only really help with Auria, not other iOS DAWs, I think you’re right. so, we're up to, what, 10 users? There seems to be some disconnect between the behavior I’m observing and what being reported. To date I’ve spent about a hour playing with the new midi learn functionality. So far I’ve only played with the volume slider. It appears, I can use audiobus3 to connect to the master, the subs, and the auxs in Auria. The learn function will attach to volume slider, left right pan, mute, solo, play/stop, trigger. I bought a Behringer xr18 and boots up nicely with auria. My Akai Advance has no sliders. The adjust continuously option, tops out at 127 presumably because the cc midi commands only have a range of 0 to 127. The nudge option does not seem to be paying attention to the cc value, so I can’t move the volume up and down as a function of the direction of turn on the knob. I have not tried to used the assign dB option. I imagine that would work, but manually assigning 128 values seems a bit tedious. I was kind of hoping to see the codebase for the midi learn functionality, but didn’t see it in the codebase. It seems like this new feature coupled with audiobus can bring a lot of variety into the surface control domain. Any recommends on a surface. I don’t think my Akai will be adequate. The Behringer is Mackie MCU compatible. That’s why it works. It doesn’t need Audiobus at all to work with the mixer. If you were able to get any faders at all to move with the Akai and midi learn, it was just pure luck. I believe Korg NanoKontrol and NanoKONTROL Studio have a way to boot into MCU mode to work with Auria’s mixer. AudioBus is not needed. If you use the midi learn it will probably only mess things up. Ok, I see what you're doing. You're using the IAA out ports of Auria in Audiobus and midi learning the port levels in Audiobus? It works though, but I guess there's a bit of latency with the audio. Ahh ... that would make more sense. Yes ... through audiobus’s new midi learn feature. I’m only targeting mixer control. Any leads on the various mixer/midi/audio protocols being used by audiobus. With regards to protocols, it would seem that someone would have already solved the protocol translation problem. I would be interested in any reference material or books references on the protocols in play. Also ... for everyone’s reference, when you connect to a mixer, audiobus brings up the midi learn feature for mixers. So is Cubasis the go to IOS DAW? And why? No. It brings up the midi learn for AudioBus’s mixer. It does not bring up midi learn for Auria, Cubasis, or any other DAW’s mixer. If you’re sending audio from another DAW such as Auria through AudioBus, then yes, moving the AudioBus fader will adjust the volume of that audio. There is no special protocol other than the straight-up midi protocol. A midi cc message has three parts: midi channel, cc number, and cc value. So, if a controller is sending cc 20 on channel 1, then when you learn that to a fader in AudioBus, with the default settings (adjust continuously, range 0-127), a value of zero (usually all the way counter-clockwise for a knob) is going to set the fader to zero. A value of 127 (usually all the way clockwise for a knob), it’s going to set the fader to 100%. All that stuff about MCU and HUI protocol was about when you’re trying to control Auria’s mixer faders in Auria, not in AudioBus. So, you can forget about that if all you’re trying to do is control the AudioBus faders. No translation is needed. There are other ways AudioBus midi learn can be used, such as setting a specific value when certain note is pressed, but you seem confused enough already. There is no one DAW that has a consensus behind it. A lot depends on your priorities and interests and requirements. 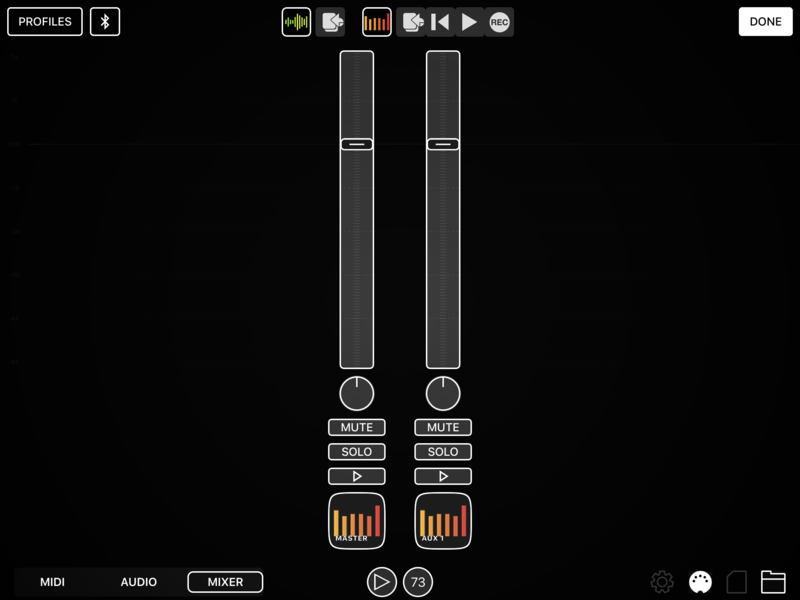 Not sure if this will work, but I’ve uploaded a pic of Audiobus controlling auria via the mixer window. Pic shows audiobus mixer control of the auria master and one of the auria Auxs. Conceptually, it seams that a MIDI to Mackie translation is taking place under the hood. The issue I was trying to get around was getting the fader to cover the whole dynamic range of the mixer. The 0 to 127 perhaps got me to 0dBFS, but not the full range. I got the impression, in my limited reading, the Mackie protocols were a specific mapping of MIDI. I was thinking that even if this was not the case, it could done. It also seems reasonable that any surface could be mapped to any arbitrary DAW. That picture isn’t showing Auria being controlled. The audio is coming out of Auria and into AudioBus. As that audio is going through Audiobus to your speakers or headphones, Audiobus is lowering or raising the level using the faders. No. Time to forget about the Mackie MUI protocol. That would be relevant if you were controlling Auria’s faders. You aren’t. If you don’t believe me, then flip over to Auria and look at them. They won’t move no matter what position the Audiobus faders are in. OK, now we’re getting somewhere. With the default setting of “Adjust Continuously”, 127 should get the Audiobus fader to +24 dB. Maybe you were looking at the Auria fader sitting at 0dB. It’s gonna do that because it’s not going to move. Look at the Audiobus fader and see if it’s moving all the way. If not, can you send a screenshot of the midi learn settings? They’re a proprietary midi protocol. I’m not sure what they use, but it’s probably “sysex”. Yes, assuming one can get a copy of the specification, they could make a script converting cc’s into MCU protocol commands. It would be a lot of work. The only DAW on iOS that would benefit from it would be Auria. No other DAW that I know of can have it’s mixer controlled by Mackie protocol. @AkaiAdvance - I thought you might like to know that the Stagelight DAW does allow simple midi cc mapping for its mixer faders. You don’t need Audiobus or any proprietary protocols.